Approximately four years ago in June 2008, on the occasion of Mr. Mandela's birthday bash, London's Hyde Park gave birth to the idea that nothing could be more fitting than to celebrate Mandela's birthday each year with a day dedicated to his life's work, his charitable organizations and to ensure that his legacy continues forever. In November 2009, the UN General Assembly joined in and declared July 18th as Nelson Mandela International Day in recognition of the former South African President's contribution to the culture of peace and freedom. Since then, a unanimous resolution of adoption was taken on November 10th 2009 and the Mandela Day has been officially adopted by the United Nations (UN) as "Nelson Mandela International Day" It is now an annual celebration. On the day Mandela celebrated his 94th birthday, July 18th 2012, the UN joined a call by the Nelson Mandela Foundation to devote 67 minutes of time to helping others as a way to mark Nelson Mandela International Day. Tagged in his honor, "My pledge to take action & inspire change in honor of Nelson Mandela International Day." To see all 67 suggestions for action, and how you too can take action, inspire change, and to change the world visit the Nelson Mandela Foundation site. 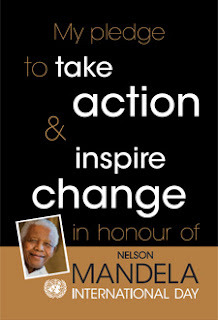 For Nelson Mandela's biography, visit Nelson Mandela Centre Of Memory. You may also like a Chronology of Nelson Mandela's Life.